What if My Child is Finding Their Homework Too Difficult? Home > Advice for Parents > What if My Child is Finding Their Homework Too Difficult? It is likely that, at some point, your child will be set a piece of homework that they find too difficult. The task may be set at a level higher than that at which your child is working, it may require your child to have an existing knowledge of a subject that are in fact unfamiliar with, or the skills involved may simply be too challenging for them and the stage they are at. If and when this situation occurs, there is no need for either you or your child to worry. Indeed, an especially challenging task can be entertaining and rewarding to tackle. The key is not to give up. Whilst your child may not be able to complete the whole task, encourage them to give it a go. If the homework task takes the form of a number of questions, encourage your child to attempt each one individually. Even if they cannot find the definitive answer, jotting down a few ideas and attempting to work through the problem will be worthwhile. Ultimately, it is vital that your child hands in some form of work and does not miss their deadline. Whatever you do, don't be tempted to complete your child's homework for them. This will be of no benefit to them and may cause confusion if your child later wishes to talk to their teacher about the level at which the homework they are receiving is pitched. Instead, you might like to talk them through the task in a different way, using alternative language. You might like to give them a few hints or clues. If they are unable to answer particular questions that have been set, consider taking the time to discuss the issues and ideas involved with them. This will ensure that your child's time has been well spent. Secondly, it may enable them to conceive of new ways in which to tackle the task. Talking about the subject matter will enable them to gain a little confidence, easing any worries they might have. 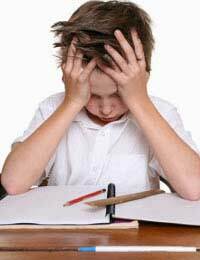 If your child is repeatedly finding homework tasks too difficult, don't allow the demoralising experience to continue. You might suggest that they have a private word with their teacher; you could discuss in advance what they plan to say. Alternatively, you could consider writing a note for their teacher, or sending them an email. You might even like to arrange an appointment. It is likely that your child's teacher will be pleased that the matter has been raised and will be eager to work towards a solution that suits everybody involved. When your child is finding homework too difficult, their confidence can suffer. Empowering them to use their imagination and to see that they can tackle aspects of each tasks will renew their belief in their abilities. In turn, this will inspire them to persevere with more difficult work and teach them to enjoy a challenge. Why My Child is Unable to Complete Their Homework? How Can I Help My Child to Become Organised? Should I Reward My Child for Completing Their Homework? How Can I Make My Child's Homework Fun? What if My Child is Finding Their Homework too Easy?